I’m thrilled to do this guest post for Carol. I’ve been a huge fan for a long time, so this is such an honor to be a part of her inspiring Ditch The Wheat site. Our goal from the beginning at PaleoNewbie.com has been to encourage everyone to eat real food, and reward those who do with some great-tasting paleo and gluten-free recipes. We try to make paleo cooking as quick and easy as possible, and come up with gluten-free versions of dishes you might have enjoyed in the past that don’t taste like something’s missing from the new “healthy” version. I know frittatas have been done by just about everyone, but I wanted to share my favorite version with you. I really like this one because there are many people who just can’t tolerate dairy. 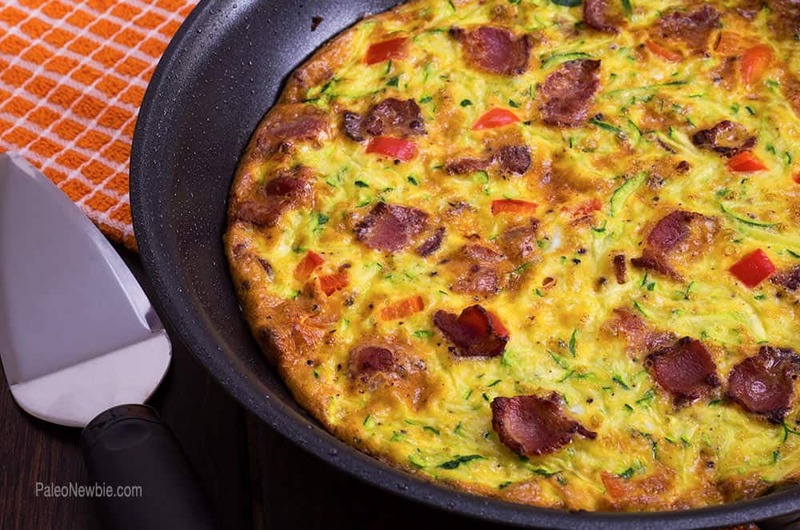 And let’s face it, lots of people will say, ‘What’s a frittata without the cheese?’ Well for this dairy-free frittata recipe, I added full-fat coconut milk to give the eggs that creamy texture I know you’re looking for in the very first bite. I also added zucchini and red bell pepper for a sweet, peppery zip. The result I think is amazing! This recipe is so easy, looks beautiful, and practically guarantees you huge kudos from everyone around the breakfast table. And we all love that, right? 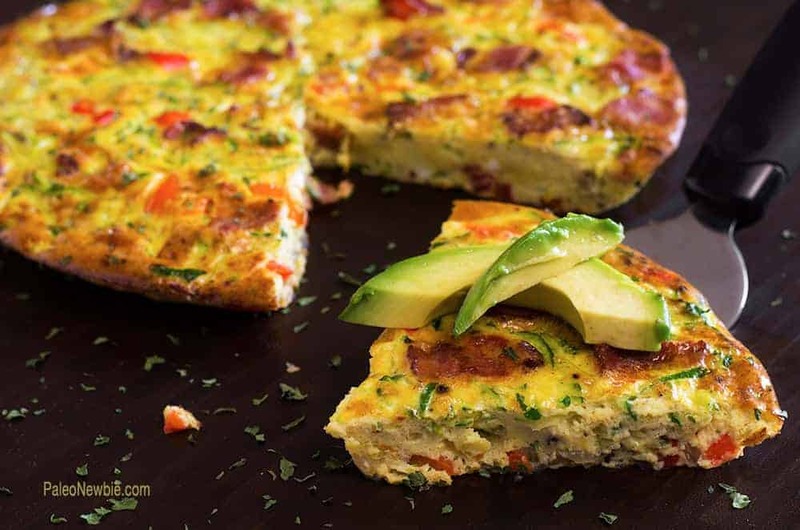 🙂 If you’re cooking for just 2 or 3 people, this recipe is perfect because the leftover slices can be reheated and served for another wonderful breakfast, brunch or even lunch the next day. Hope you try this little gem. I’m sure it will become a new breakfast favorite! Trina blogs at Paleo Newbie. Trina is an Italian girl who loved her pastas and panini. All that changed when her husband suggested they try the Paleo lifestyle. He’s obviously not Italian. So she said arrivederci to the primavera, and hello to the Paleolithic. Her site is about her new adventures inside the caveman’s culinary world. 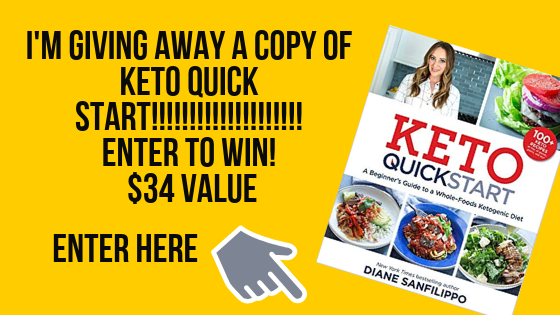 She’s on a mission to create the best-tasting recipes she can that stick pretty close to the paleo rulebook. Kelly @ The Nourishing Home recently posted..Day Zero: Getting Ready For Whole30!